Human or a dog, the body undergoes important restorative functions while sleeping that keep the mind and body strong and healthy. Though a dog’s sleep cycle differs from humans, sleep is no less important to their overall health. You can make sure your dog is getting the rest he needs by checking his unique factors like size and age and creating a supportive sleep area for him to rest. Dogs move through the same sleep stages as humans. They experience everything from the easily interrupted stage one sleep to rapid eye movement (REM) sleep, wherein the brain functions similarly to that when awake. If your dog has ever barked or “ran” with his legs while asleep, he was probably in REM sleep. However, the makeup of a dog’s sleep cycle is different based on their instinctual survival needs. We humans sleep for seven to nine hours at a time, experiencing five or six 60 to 90-minute sleep cycles, wherein we pass through five sleep stages. Dogs, on the other hand, have a much shorter sleep cycle. Though they experience all five sleep stages, they go through them in about 16 minutes. They may then wake up for five minutes before falling asleep again for another 16-minute cycle. The nature of a dog’s sleep cycle makes sense when you look at it from an evolutionary standpoint. A dog’s instinct is to protect its pack. A short sleep cycle allows him to stay alert to potential danger, which makes them the perfect protective companion for humans. Age: Puppies and older dogs sleep the most, up to 20 hours, while adolescent and adult dogs need less sleep, anywhere between 12 and 16. Size: Large dogs use up energy faster than small dogs and therefore sleep more. Activity Level: It may seem counterintuitive to energy needs but sedentary dogs tend to sleep more than active dogs. Movement keeps a dog awake while inactivity causes them to drift off to sleep. Plenty of Exercise: Exercise helps keep your dog’s cardiovascular system in shape. It also helps burn energy so he doesn’t tear through the house like a terror. Even though regular exercise may keep your dog awake longer, he may sleep better because he’s more tired out. Adequate Food: Good nutrition supports your dog’s physical, mental, and emotional needs. Consult with your veterinarian and make sure you feed your dog food that works for his size, age, and any unique nutritional needs. Private Sleeping Area: Your dog might not be able to get the rest he needs if his sleeping area is loud and crowded. A dog house, garage, or quiet area inside your home will give him the privacy he needs to sleep uninterrupted. Keep Him Comfortable: Dogs aren’t as sensitive about their sleeping area as people, but they still need to be comfortable. Your dog should have an area that’s dry and comfortably warm. Depending on your dog’s coat, he may need a space heater to maintain his body temperature during the winter. Your favorite furry friend may not be able to tell you but rest assured he needs sleep as much as you do. 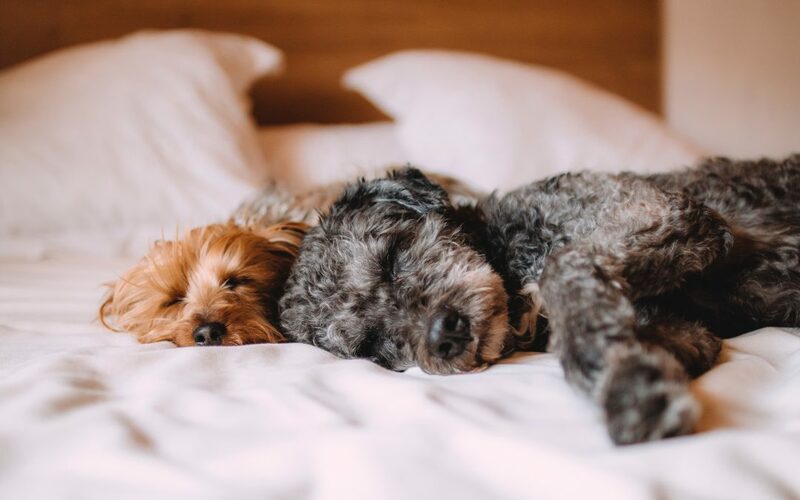 As long as you provide a sleep space that’s safe and comfortable and you’re meeting his nutritional needs, your dog is most likely getting adequate rest.